Report courtesy of Joakim Thilén. After the loss to Malmö in April the Lugi team has been working hard on training. A lot of the trainings have been focused on getting the scrum to work as one unit as well as the backs to find their running lines in attack. A lot of the trainings have also contained a fair amount of contact. 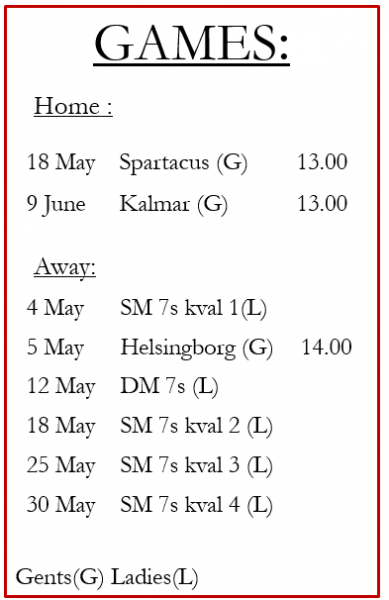 Saturday 14th of May at 14:00 Lugi kicked off against Pingvin in Trelleborg. Almost immediately from start one could see that the hard work at trainings were paying off. Hard hits were put in all across the field. 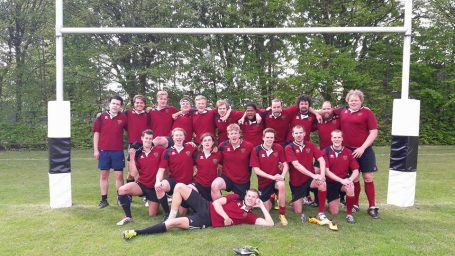 Daniel, Eric and Anton started their first XV-aside game ever. Daniel showed Lugi that he is a second rower to count on, giving good pressure in the scrums as well as making his way to most of the rucks in the game. Now from a hard working forward to a good looking back, Eric had his first touch of the ball of an off load from Jordan and decided that the only reasonable thing to do in one’s first match of the career is to score the opening try. In every Lugi players mind there have always been this belief that we are a small team and that we are not supposed to play any forwards game. Fielding a scrum that to my knowledge carries over 750 kg is not a small team, specially not in division 2. The decisions taken during the game also showed that this belief belongs to the past. Lugi’s forwards won most of there own feeds as well as some of Pingvins. In the line outs we stole some throws of Pingvin as well as putting up an 8 man maul of the throw. The maul was created outside the 22 and mauled onto the 5-meter line were Sebastian could easily break loose and score Lugi’s second try. Half time the score board showed 12-5 in advantage of Lugi. In the second half Lugi struggle with finding the passion and the discipline that a game this close requires. Pingvin brought on a lot of fresh legs while Lugi where struggling to find the pace of the game. Due to the lack of discipline a lot of penalties where given away and Pingvin could score twice. After Pingvin’s second try of the second half Lugi managed to fire up. The wannabee-back, the sidestepping prop, Viktor was told to report for backline duty. He took his duty with pride, after a quick ruck the boll was delivered to Viktor and he delivered a try in return. Lugi continued to play with passion and working hard. All the hard work from Lugi resulted in Olof and Jonno having their own competition about who had the most cramp as well as Viktor finding it hard to lift his arm. In the final minute the score was 19-24 in advantage of Pingvin. As true rugby players Lugi were set to play till the whistle blows. From outside 22 Jordan decided to show off his stepping skills that he normally use on the dancefloor, by pretty much stepping or outrunning half of Pingvin’s defense by himself he managed to score a try close to the posts. The score was at this point 24-24. A conversion was to be made by Tobias. While Lugi jogged back to set up for kick off a passionate motivational speech was held by myself. In the meanwhile Tobias had measured up his steps for the kick, taken the three steps up to the ball and kicked it right in between the uprights! Score 26-24. The ref decided that this was the end of the game and blew the final whistle. Lugi have won there first XV-aside game of the season! To win a game in this way feels a little bit like stealing candy from a child. You feel a bit bad about yourself but then when you taste the candy the bad feelings soon go away! Big thank you to Pingvin for hosting us, as well as putting up a great effort in the game. Next Saturday Pingvin are coming to Centrala IP for the re-match. Im assuming that both teams will be working hard on trainings to put up yet another great game! This entry was posted in Match Report, Men's Team, News and tagged Lugi, Pingvin, rugby, Sweden on May 15, 2016 by Ross.